To stimulate active immunity against Blackleg (Clostridium chauvoei infection) in cattle and sheep. Refrigerated product. POM-VPS. A suspension for injection, containing whole culture of Clostridium chauvoei. Also contains potassium aluminium sulphate (as adjuvant) and thiomersal (as preservative). 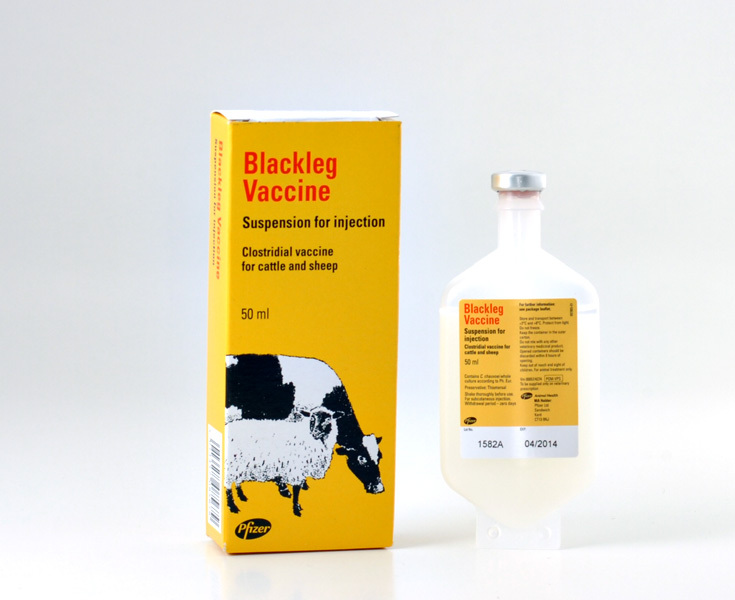 For the active immunisation of cattle and sheep against disease associated with infections caused by Clostridium chauvoei (Blackleg and post-parturient gangrene). Onset and duration of immunity have not been determined for this vaccine. By subcutaneous injection, preferably in the loose skin on the side of the neck, observing aseptic precautions. Shake bottle thoroughly before use. Syringes and needles should be sterilised before use and the injection should be made through an area of clean, dry skin, taking precautions against contamination. Cattle: two doses of 2 ml administered six weeks apart, 2-3 weeks before the expected period of risk. Sheep: two doses of 1 ml administered six weeks apart, 2-3 weeks before the expected period of risk. Revaccination with a single dose is advised annually before the expected period of risk. Do not vaccinate sick or immunodeficient animals. No side effects other than those listed below are expected when the vaccine is used between 8 and 2 weeks prior to parturition. In the absence of specific data, the use of the vaccine during the first or second trimester of pregnancy should be avoided. Avoid stress in pregnant ewes and cows. Clinical trials have demonstrated that the presence of maternal antibodies against C. chauvoei may reduce the antibody response to vaccination in young lambs. Therefore, to ensure an optimal response in young animals with high levels of MDA, the primary vaccination should be delayed until the levels wane (which is after about 8-12 weeks of age). In the event of an anaphylactic reaction appropriate treatment, such as adrenaline, should be administered without delay. Most vaccinated animals may experience reactions to vaccination. These reactions are usually localised swelling (up to 14 cm in diameter, which resolves in less than 10 weeks) or induration at the injection site but may also include abscess (in up to 17% of animals) or other reaction in underlying tissues at the injection site. Skin discolouration (which returns to normal as the local reaction resolves) and localised pain for 1-2 days post first vaccination may occur at the injection site. The local reactions do not affect the general health, demeanour, feeding or weight gain of the animals. No information is available on the safety and efficacy from the concurrent use of this vaccine with any other. A decision to use this vaccine before or after any other veterinary medicinal product therefore needs to be made on a case by case basis. In the case of accidental self-injection, encourage bleeding and wash the area immediately with water. If a local reaction develops, seek medical advice showing the package leaflet or the label to the physician. Store and transport between +2°C and +8°C. Protect from light. Do not freeze. Shelf-life after first opening the immediate packaging: 8 hours. Cardboard box with a 50 ml high density polyethylene (HDPE) bottle. Not all pack sizes may be marketed. In any animal population there may be a small number of individuals which fail to respond fully to vaccination. Successful vaccination depends upon correct storage and administration of the vaccine together with the animal's ability to respond. This can be influenced by such factors as genetic constitution, intercurrent infection, age, the presence of maternally-derived antibodies, nutritional status, concurrent drug therapy and stress. Below are some recent questions we've received regarding Pfizer Blackleg Vaccine to Stimulate Immunity Against Blackleg, including answers from our team. Some of my cattle showed signs of loss of apertite and their back legs started shivering. Within 24hrs they were dead. Is there any vaccine that can be administered to cattle once they shows such signs? Is there any vaccine that can be administered to prevent cattle from contracting the disease? Cattle which are starting to show signs of disease normally die before there is a chance to treat them. If they receive a large dose of the appropriate type of penicillin at the very first signs of illness, it is possible that they might be saved. The vaccine is not really of use to treat ill animals, but if you vaccinate the entire her periodically when they appear perfectly well, this should provide good levels of immunity and vaccinated cattle are less likely to be affected in future. Your own vet should be able to advise you about this, having knowledge of your local area. Infection comes from the soil and is difficult to eradicate.